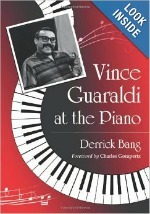 Bang’s 2012 book is less a full-fledged biography than a comprehensive survey of Guaraldi’s career loaded with anecdotes. The pianist was a committed jazz artist who became famous through indelible identification with a major phenomenon of popular culture. Millions know him through his music for the Peanuts television specials. Yet, dedication to his work as an improvising musician lasted until the end of his life in 1976. Bang traces Guaraldi’s progress from early sideman work with Conte Candoli and Cal Tjader through his hit, “Cast Your Fate to the Wind,” to the success of the Charlie Brown soundtracks. Extensive quotes from colleagues help capture the personality that allowed Guaraldi to be simultaneously endearing and uncompromising. A great read. Finished it in 2 days in 2012. A great book that masterfully fills the information void on one of the 20th Century’s most under-appreciated jazz popularizers and pianists. I devoured it when I first got it, and find myself returning to it regularly as a reference.